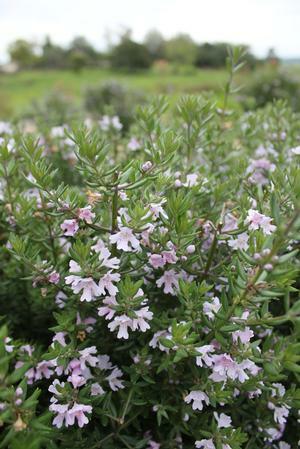 Coast rosemary was first introduced into cultivation in the U.S.A. by William Walker at his Golden Gate Nursery in San Francisco in 1858. 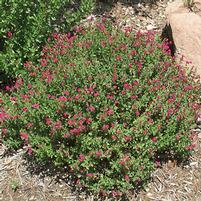 It has a long history in California landscapes and has proven itself to be a useful, water-wise and long-lived shrub in both home and commercial landscapes. The name for the genus was given to it by Sir James Edward Smith, an English botanist and founder of the Linnaean Society in 1788. The name honors Dr. Johan Peter Westring (1753-1833), a botanist and physician to King Charles XIII of Sweden who was a student of Linnaeus. The specific epithet comes from the Latin word 'frutico' meaning "to put forth shoots" or "become bushy," probably in reference to the dense bushiness of this species. Coast rosemary (Westringia fruticosa) is native to the coast of New South Wales in Australia where it can be seen hugging the cliffs and growing near the beaches. Aussie Box has a dense, rounded growth habit. It forms a mound of attractive, narrow gray-green foliage that rarely needs pruning unless you're using it as a formal low-growing hedge. Pale lavender quarter-sized flowers appear in small clusters along the stems from late winter to summer and sporadically throughout the rest of the year. 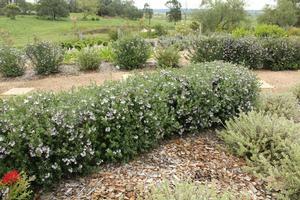 You can plant Aussie Box coast rosemary in full sun or light shade. It's tolerant of salt-laden winds, so is a particularly good shrub close to the ocean. Aussie Box is tolerant of most soil types including clay. Just make sure it's not planted in a location that's likely to be completely waterlogged for days on end in the winter. If you have a very sandy soil, we recommend adding a lot of organic matter to it in order to make it more water retentive and reduce the need to water your plants in summer. Once established, Aussie Box should survive without any summer irrigation in coastal areas. Propagate Aussie Box by semi-ripe stem cuttings. As the plant is patented, you can't propagate it for commercial gain though.